I was pleased to see that Katie had focused a good amount of the agenda and speaker slots for talks given by regulators and public utility officials. This is important because unlike previous waves in the Valley which relied only upon access to capital and technology innovations, the clean technology movement likes at the intersection of 3 forces: access to capital, tech and hard science innovation, and regulatory forces. The point about government holding the keys is symbolic and quite literal because for a wide range of these technologies to become real they will require the consent of regulators and the government pocket book funded by taxpayers. No where is this more obvious than electric vehicles, on the “new networked car” panel the Nissan spokesperson repeatedly referenced the $20k price point “after government rebates and tax credits”. At one point he admitted that all of these vehicle makers were in a race to achieving manufacturing economies before the taxpayer funded subsidies ran out. I also found it poignant that PG&E was on this panel talking about how “excited” they were about vehicles transitioning to electricity but repeatedly emphasizing that off-peak recharging was essential. In other words, PG&E has slack capacity at night and they see recharging EVs as something that can take up that slack and generate revenue for them without additional capital expenditures to expand generation capacity. The research I’ve followed indicates that EVs are pretty inexpensive to operate on a per mile basis, with the big caveat that the entire cost equation gets a big hole blown in it if people start charging during peak hours. What does it all mean? In short, PG&E and the state have conspired to create a rate system that isn’t linked to actual energy production and distribution costs, the rate system is intended to reduce electrical consumption. This reflects our historical dependence on electricity produced with non-renewable fuels even though California was well ahead of the nation as a whole in utilization of natural gas as a fuel source. This reality is setting up a major clash with consumers who are being pushed to replace vehicles powered by hydrocarbons with vehicles powered by electricity. A California Public Utility Commission board member, Dian Grueneich, gave a talk that emphasized this point but not with the criticism that I just leveled. Grueneich highlighted that California’s per capita consumption has remained constant for the last 30 years, what she didn’t say is that 22% of the state’s manufacturing capacity and the jobs associated with it have left the state in that same period. In other words, Californians are not using less energy but rather the large industrial users of power have left the state, ironically in part because of high energy costs. Californians have implemented energy efficiency solutions in home and commercial buildings, all of which should be held up as a success but those efficiencies and the regulatory burden associated with them have also created some of the highest construction costs in the country (in surveys of residential and commercial structures San Francisco, as one example, consistently ranks 2nd to NYC in cost per square foot to build). As I just wrote, this emphasis on conservation is in conflict with an expanding vehicle market and the car makers understand this but are powerless to do anything about it. Over and over I heard the representatives focus on off-peak charging but admit that there is nothing in the vehicles that facilitates rate based charging cycles. The Electric Power Research Institute (EPRI) has been tasked with developing a smart charging protocol but it is not available yet and car makers, in their own words, are “not waiting for it”. 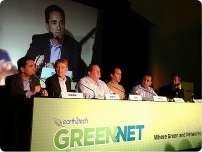 Grueneich also pointed out that the CPUC has ruled that utilities must make power consumption data available to third parties, which would go a long way to realizing the vision of the “future of carbon tracking” panel whereby businesses and ultimately consumers could plug in third party solutions for managing power consumption. This is how software people think… develop and API and build an ecosystem, it’s not how utilities think and even though the ruling requires data to be made available I am concerned about how useful that data ends up being for third parties. Given the fiasco that California’s smart meter program has been, it’s appropriate that we start talking about a new scheme that splits of the consumption metering and billing from the power generation and delivery. In other words, we should consider the merits of making utility metering a public service funded by existing rates. This service would then provide integrated billing services for consumers and assume responsibility for household and business metering infrastructure, which is currently managed by PG&E. The data that meters generate would then be made available with appropriate privacy controls to third party services who want access to it for powering a new generation of software services for business and consumer users. After taking a couple of days to reconsider the material I collected and my own notes I have to say the GreenNet conference was quite interesting and I hope GigaOM expands it next year. I would also like to see more critical voices on the panels that would hold accountable regulatory officials and utility spokespeople while at the same time casting a critical eye on the new technology being developed.